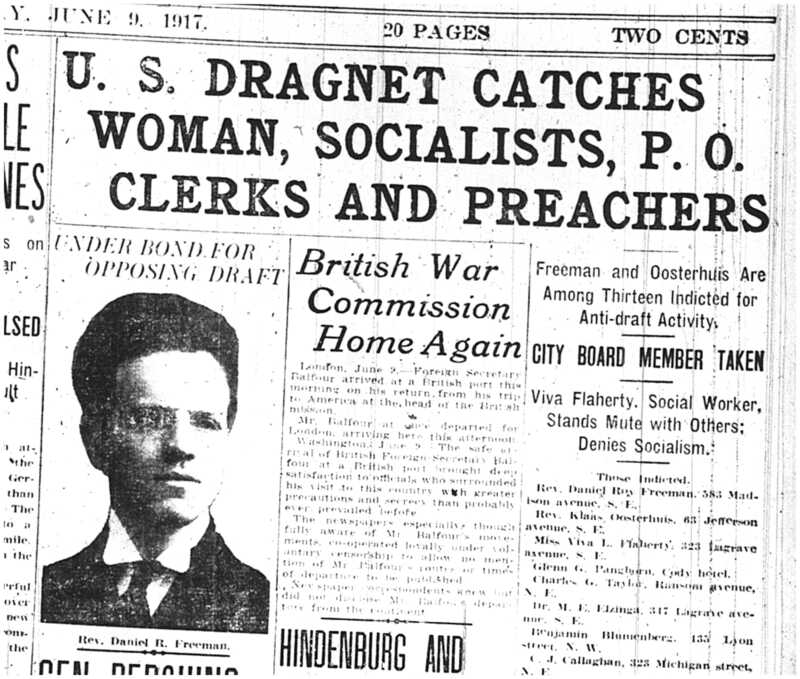 In May of 1917, several members of the Socialist Party, two clergymen and Feminist/Labor supporter Viva Flaherty were arrested in Grand Rapids for distributing anti-conscription pamphlets near downtown Grand Rapids. The Espionage Act was passed in 1917, as a means to silence and punish those who spoke out against the US entry into World War I. However, as radical historian Howard Zinn points out, these laws were not applied equally and were meant to target dissidents during WWI, particularly radical labor organizers, socialists and anarchists. Some of those arrested for opposing the US entry into WWI were arrested and jailed, while others were arrested and deported. The level of contempt that the US government held against radicals involved in labor organizing and anti-WWI activities eventually led to the Palmer Raids (1919-1920) as a justification for “cleansing” the US of radical leftists, socialists and anarchists. 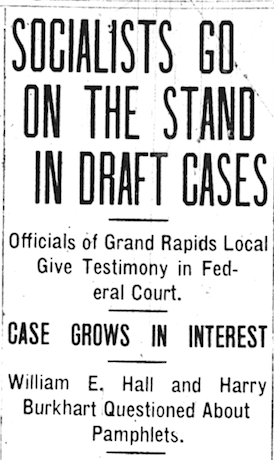 Those arrest in May of 1917 in Grand Rapids fell under the category of dissidents and radicals. There were several who identified as Socialists and then there was Viva Flaherty. Flaherty was the only woman arrested in May of 1917, but she was possibly the most well known of the group, particularly in Grand Rapids. 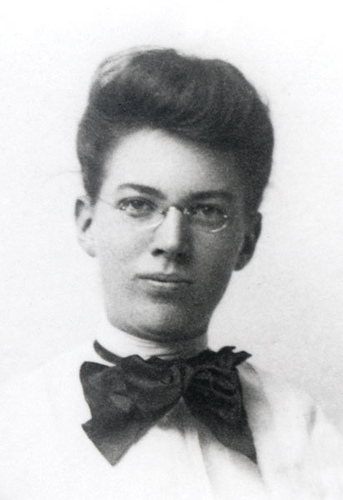 Viva Flaherty was some who gave us one of the best accounts of the 1911 Grand Rapids Furniture Workers Strike, when she published, History of the Grand Rapids Furniture Strike: With Facts Hitherto Unpublished. Flaherty, along with those she was arrested with, were passing out anti-conscription pamphlets on Division Avenue near downtown Grand Rapids and on Bridge Street. They had 15,000 copies printed from the Furniture City Printing Company of Grand Rapids. Almost all active members of the Socialist Party have been arrested and indicted by a Federal Grand Jury. Principal charge is that the accused, by the circulation of literature and “thru demonstrations, mass petitions and by other means,” conspired to “prevent, hinder and delay” the execution of the conscription law. There were six counts in the indictment. 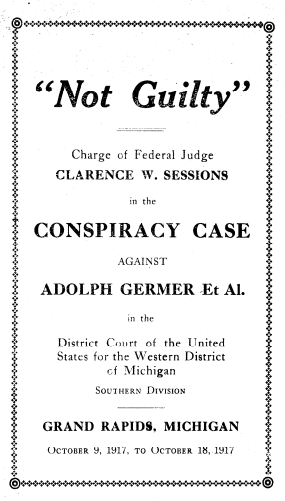 National Secretary Adolph Germer, of the Socialist Party, was also indicted by the same jury and charged with conspiracy. On learning the “news,” Comrade Germer went to Grand Rapids, submitted to arrest, plead “not guilty” and was liberated on bonds. If necessary, these cases will be carried to the highest courts. Grand Rapids has a population around 130,000—mostly wage slaves. Scab labor runs its factories. It is a typical American Billy Sunday burg. Therefore all the fury of the pulpit and the press was directed against the socialists. Among the indicted comrades are Ben A. Falkner, financial secretary of the Local. For years he has been employed in the city water works department. He has been fired and blacklisted by the political patriots. Comrade G. G. Fleser, corresponding secretary of the Local, who had worked eight years for the Grand Rapids and Indiana Railroad as a stenographer, was discharged by the patriotic rail-plutes. Viva L. Flaherty, social worker and writer; Charles G. Taylor, member of Board of Education; James W. Clement, manufacturer; Charles J. Callaghan, postal clerk (discharged); Dr. Martin E. Elzinga; G. H. Pangborn; Vernon Kilpatrick; Rev. Klaas Osterhuis, and our wellknown, active old-time Comrade, Ben Blumenberg. Viva Flaherty may not be well know, especially for her opposition to the US entry to WWI and the military draft, but future generations should look to her for inspiration as someone who challenged political and economic power structures in Grand Rapids. Flaherty lived to be 84, eventually dying in 1968. 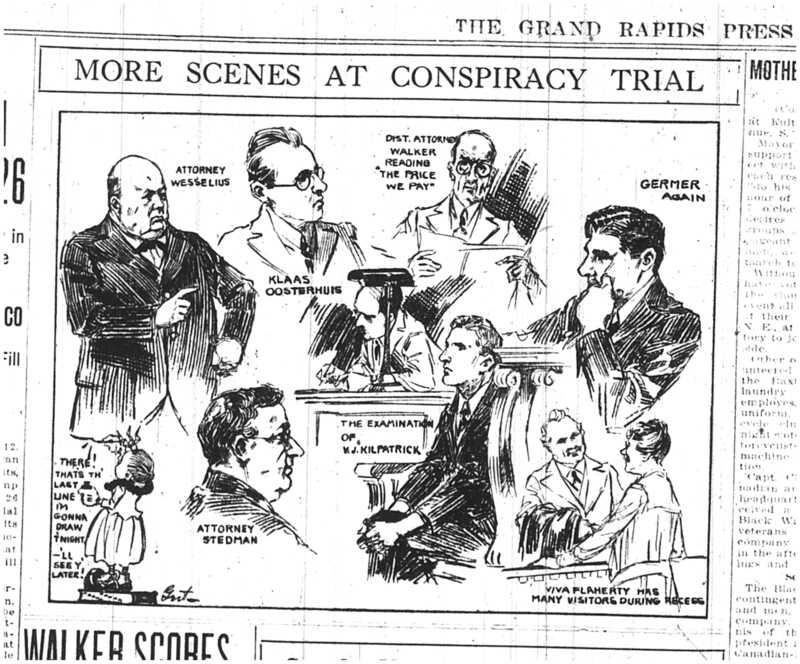 This entry was posted in Anti-War/Anti-Imperialism and tagged conspiracy trial in Grand Rapids, Grand Rapids activists arrested for opposing WWI, Grand Rapids anti-conscription pamphlet, socialists in Grand Rapids, Viva Flaherty. Bookmark the permalink.